From: "Elizabeth R. Vaughan, M.D." This is probably a duplicate mailing to some of you, but I wanted to share this w/ EVERYONE. The absolute best part of receiving the award was having my parents there. Thanks for coming, staying over and meeting everyone that has been apart of my life in Martinsville. Then touring my office and even getting the first Millennium calendar in the family. I was on TV this past Friday night and had a great time discussing the award, the community, and the fact that I'm just a regular person too. Had a great time. Love to each of you. I'm pleased to announce that my dear wife Dr. Elizabeth Vaughan was named Citizen of the Year for Martinsville VA last night. She is the first physician ever to receive the award. 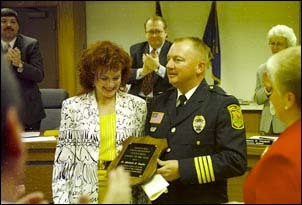 Traditionally, the award originates with a committee of senior officers in the police department; the nominee is then run past the Mayor and Council, and then it's announced. I'm not quite sure why it works that way, but it always has. While I guess she's received trophies, awards, certificates and plaques from just about every organization in the county, in Martinsville/Henry County, the Citizen of the Year award is the Big Enchilada. While the award is "... of the year" it's always given to people who have a long record of community service. And while it originates in the police department, it's actually an award for community-wide service. In giving the award, it was noted that over the years she has helped raise an average of about $100,000 a year for various causes in the community. When the police department was particularly strapped for funds in 1996, she donated her sports car to the department, which raffled it off ("Win Dr. Vaughan's Car!") and raised enough money to meet the department's shortfall and buy digital identification equipment and bicycles for the bicycle patrol. Normally, even the recipient doesn't know until the award is made -- they get the recipient to the meeting through some subterfuge. We were told in advance, because they were afraid Elizabeth's schedule might prevent her being there. Since we knew in advance, I was able to secretly invite her parents to come down from Kinsale VA and surprise her. Afterwards, we had a big celebration dinner with about 40 people, including her staff of 10, her parents, the Chief of Police and a several officers. This attachment is a copy of the picture they used. Following that is the page 1 article, copied off the Martinsville Bulletin's web site. [caption] Dr. Elizabeth Vaughan (left) was recognized as the Martinsville Citizen of the Year Tuesday night. Pictured here are Police Chief Mike Rogers (next to Vaughan), former police officer Anne Draper (right, facing Vaughan) and (background, from left) Vice Mayor Gene Teague, Major Mark Crabtree and Council member Elizabeth Haskell. For 16 years, Martinsville physician Elizabeth Vaughan has given of herself to the community. Tuesday evening's City Council meeting, it was time for the city to give back. Vaughan was named the Martinsville Police Department's Outstanding Citizen of the Year by Chief Mike Rogers and Capt. G.R. Ramsey. Vaughan's charitable contributions to the community since 1991 took a page to document, and included raffling off her car to raise money for the police department in 1995, donating health care to any child on Christmas day and serving as honorary chairperson of the March of Dimes Walkathon. Yet, her satisfaction arises from her holistic approach to medicine. "More than all the community activities is empowering patients, is teaching patients, is helping patients heal themselves -- that's what I love to do," Vaughan said. "There's a lot of patients who say I've saved their lives. Well, I helped them save their own lives." That is exactly what she did when Martinsville Police Investigator Mark Gilbert was diagnosed with cancer by Vaughan. "People appreciate excellence, and whatever Dr. Vaughan does, there's always excellence attached to it, whether it's in the field of medicine or it's in the public," Gilbert said. Vaughan attached sentiment to the award because of the significance to the community. "It's a sign of how much people in this community appreciate what I've done, and that means a lot to me, because one of my fundamental goals is to make a difference in people's lives; make people's lives better," she said. "...The significance is that I've touched a lot of lives, and improved their lives, and that means a lot to me." Vaughan's parents, Drs. Elizabeth S.R. Vaughan and David D. Vaughan, surprised her by attending the ceremony from Kinsale in the Northern Neck. "I realized they were here at 7 o'clock, as the meeting got started," said Vaughan, who is a fifth generation physician. "The room was filled with loads of my friends and my staff at the Vaughan Medical Center and my friends from Danbury, N.C., where I now live on my farm. I did not expect any of them to be here." Rogers remembered the way Vaughan dealt with victims of violent domestic and sexual assaults while she was the director of emergency medicine at Memorial Hospital of Martinsville and Henry County from 1986-90. Rogers also acknowledged her compassion, patience and professionalism. "She was one of the most professional witnesses I have ever seen," Rogers said. "While working at Memorial Hospital, Dr. Vaughan was one of the first doctors to teach local EMS personnel about AIDS and how they could prevent getting infected themselves."